I've finished up loads of products this month, I'm really pleased with myself! 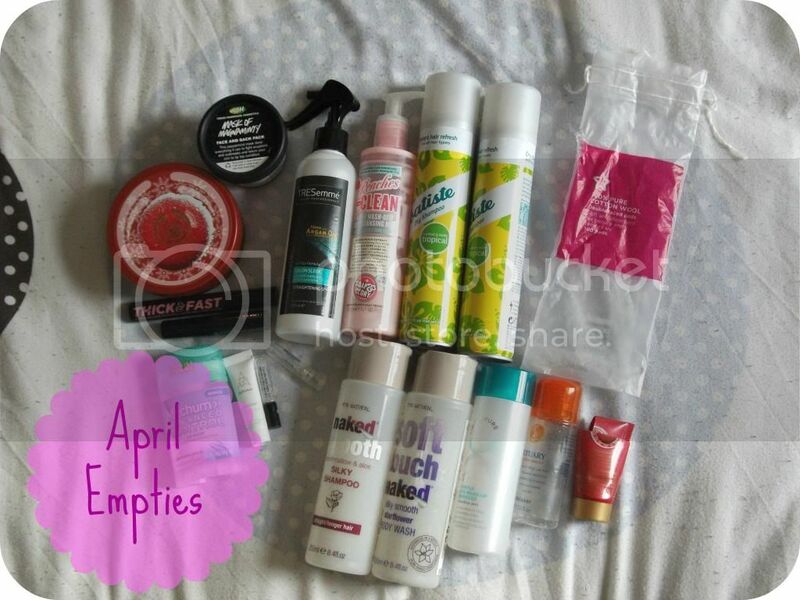 I've got a couple more that are almost empty, too, so I'll be making a start on stockpiling May Empties in the next couple of days... Speaking of which, how are we almost in May already!? This year really is going far too quickly, at risk of sounding like a complete cliché. Anyway, these are the products I've got finished in April, and what I thought of them. I've been using this since before I can remember, and my hair does blowdry or straighten much more nicely when I use it. It smells really nice, too. However, in an effort to get my hair looking a bit more healthy, I'm trying to cut out products containing silicon, which means goodbye to my beloved TRESemmé! Sad times. I liked this at first, but as time went on I went off it, as I felt it wasn't leaving my skin as clean as it could be. The pump also broke towards the end, which made it really difficult to get the last inch or so of product out of the bottle, which was a shame. This is a total staple in my Empties posts, and I've gone through two cans in April! I put that down to switching shampoos and my hair not getting on with the new one so well, I ended up using dry shampoo almost every day. I love this and always stock up when it's on offer! I liked this shampoo, but it just wasn't suited for my hair type. 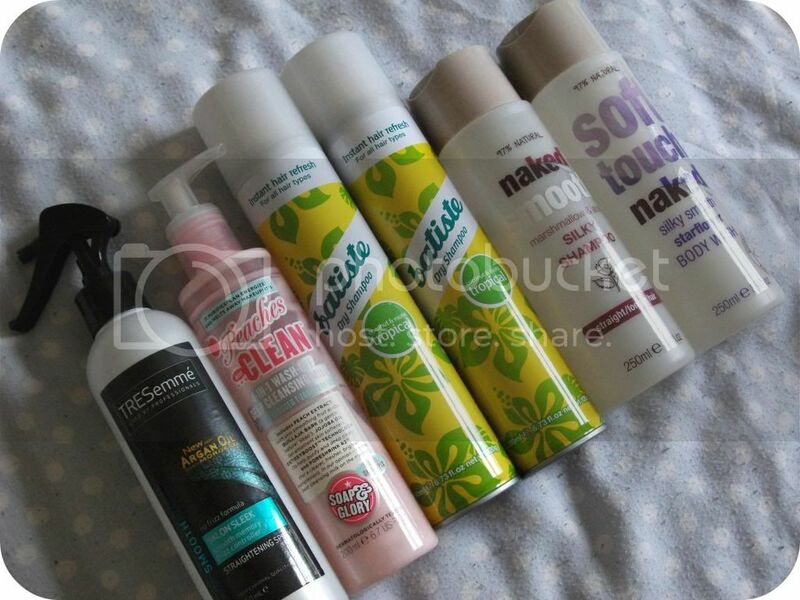 Thankfully, I got in touch with the lovely people at Naked and they recommended some other products which I'm trying out and which seem to be suiting me much better - reviews will be coming up soon! I really recommend their customer service, definitely get in touch with them if you have any questions about which products would be best for you! Repurchase? Not this specific product, but I've already bought other products from the brand. This smells amazing, like cinnamon! It lathers up so beautifully and leaves my skin feeling smooth, soft and clean. It also works well as a bubble bath, producing heaps of lovely soft bubbles. I have a sneaking suspicion that I'm not the only one who loves this - my boyfriend has been smelling oddly of cinnamon recently, too. I normally love The Body Shop's Body Butters, and I loved the smell of this one when I sniffed it in store, but sadly I've gone off it over the month - there was just a slightly alcoholic edge to it which I found really offputting. That aside, it did a great job of moisturising my legs, as they always do. I really like the pretty glittery label, too. I love this for bringing any break-outs under control! It's really good at calming down angry spots and helping with oily skin, too. 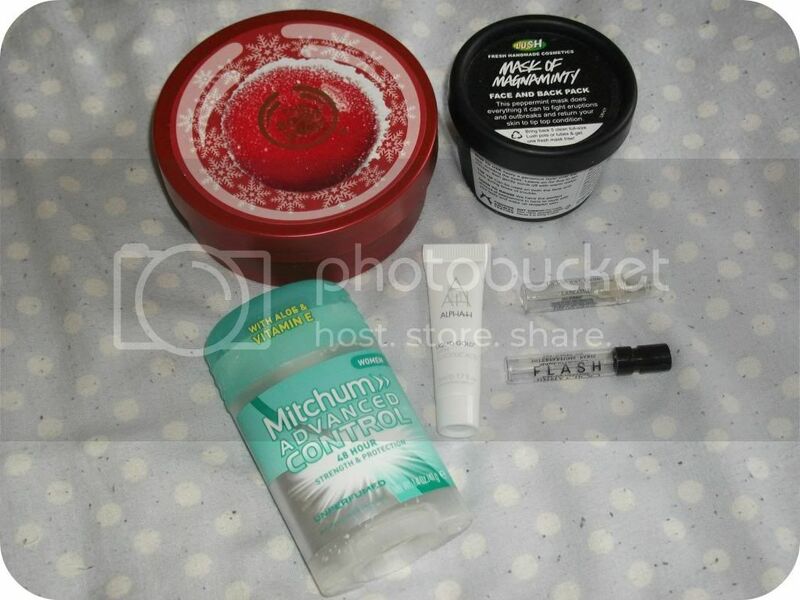 I've washed this pot out and have added it to my stack which I'm saving up to take back for my free face mask! Repurchase? Yes, once I've used up some of my other face masks. Possibly the least exciting product of the bunch - I've used this since I was about 12, I've switched to others but always come back to this as it does the job and I'm not allergic to it - bonus! It's a good price and lasts a good few months, too. I received this sample-size in a set from What's In My Handbag; actually I received two tubes this size. I do like it and I definitely feel like it's working to brighten my skin and shrink my pores, but I'm in two minds about whether to repurchase once I've used the second tube. I also struggle to remember to use it every other day - it's not part of my daily routine so I forget really easily! I'm going to review this in full soon, too. This was a free sample from Debenhams and I really, really like it - it's exactly my sort of perfume, I loved wearing it, and I'll probably buy a full-sized bottle once I've emptied one of my current scents. Not sure where this came from, it might have been a sample from Lancôme's Facebook page. Anyway, I wasn't so keen on this one; it was wearable but not one I'd choose for myself. My favourite mascara! Shamefully, I think I've had this on the go for about a year - I never throw mascara away when I'm supposed to. That said, I don't share mascara with anyone, and if I'd had an eye infection it would have been chucked immediately, but luckily I don't tend to get eye infections very often. This is perfect for everyday wear and does exactly what it claims, for me. Love! Repurchase? Already have, in my Best of All set. Not an awful lot to say on cotton wool pads, I'm afraid. I like these because they're sort of crimped together so they don't peel apart like some cotton pads do, and I use them for exciting things like removing nail polish and eye make-up. Repurchase? Already have; stock up when they're on Buy One Get One Free! I think this was another magazine freebie and I haven't actually finished it, but somehow managed to crack the lid so the mascara has dried out and I can't use it anymore. I did really like this mascara and used it quite a lot, I'd say it's as good as the Soap & Glory, although obviously more expensive! Repurchase? No, since I prefer Thick & Fast and it's way cheaper! I got this in a gift set literally years ago and have been using it recently in my baths; it smells lovely and leaves my skin feeling really soft and moisturised, although there is a slight film left on the skin afterwards. I don't know that it's something I'd buy myself but things like this are always lovely to receive as gifts! Although this did do a reasonable job of removing eye make-up, I feel it's thoroughly undeserving of the title 'Gentle' - oh my life it stings!! That said, it's cheap and cheerful, and it's okay as long as you're super careful, so I can't really complain! I had the same problem with this as with the Body Butter; I just didn't like the slightly alcoholic edge to its scent. Nonetheless, it was a lovely light, hydrating hand cream which I kept in my desk drawer and which definitely did the job for keeping my hands moisturised throughout the day. Repurchase? No, and it was Limited Edition at Christmas anyway! Phew! So, those are the products I've finished in April. Have you tried any of these? 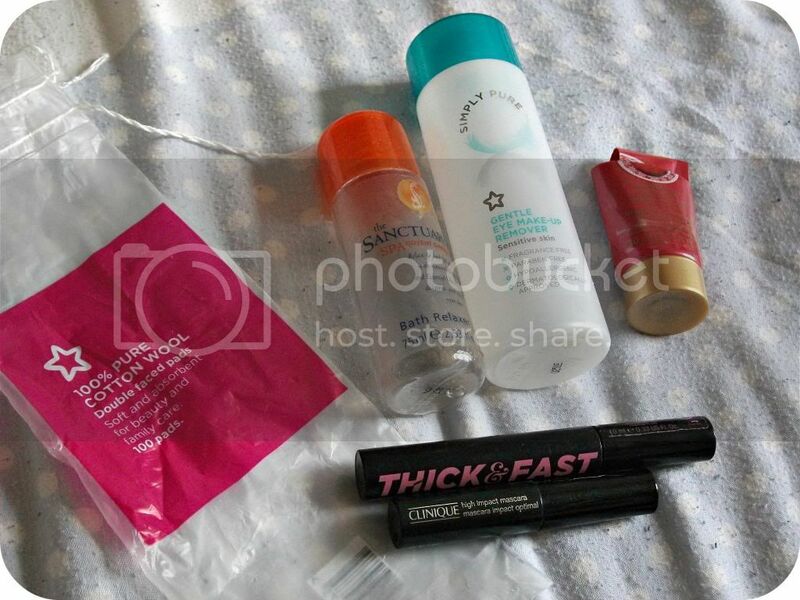 Leave me a link if you've done an Empties post, I love reading them! I'm going on a mission to use up all my hoard of products, which I need to as I have a stupid amount of body butters alone! I can't wait for the Alpha-H review, I've been umming and ahhing over it since it came out.